Geared, a $1 game from developer Bryan Mitchell with a free lite counterpart, is a clever puzzle game for the iPhone. You're presented with two already-placed gears, and a finite number of other gears in assorted sizes. Your task: arrange the gears the right way, to form a fully interconnected chain. There's no grid: You can place the gears anywhere, as long as there's enough room. 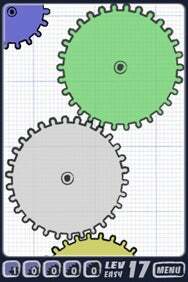 Wheels of Fortune: In the puzzle game Gears, you’ve got to arrange a series of gears so that they form an interconnected chain. The game starts out simple enough. Wait, scratch that: The game starts out too simple, and it would be easy to give up on it after you breeze through the first, not terribly complicated levels. If you power through the easy, almost boring early levels, though, you're rewarded with a solid game. Difficulty continues to ramp up slowly, but learning new gear-arrangement techniques as you progress is satisfying. That said, I do have a few complaints about Geared. It can be hard to position the gears you're dropping precisely where the game wants them to be to make contact with their neighbors; the placement part, particularly with smaller gears, feels a bit fuzzy. And the app can be a bit picky about when you're allowed to move certain gears—I found I had to push some gears off the screen to regain access to ones I'd placed earlier. In spite of those flaws, Geared is a perfectly fine puzzler. It's short—the game sports 120 mostly quick levels—but it's fun enough. The free trial contains just 8 levels, which should give you a good sense of what you'll get if you're willing to part with the buck.